Source: NLA/CAC Prod Co: Paramount Dir: Leo McCarey Scr: Bert Kalmar, Harry Ruby, Arthur Sheekman, Nat Perrin Phot: Henry Sharp Ed: Leroy Stone Art Dir: Hans Dreier, Wiard B. Ihnen Mus: Bert Kalmar, Harry Ruby. Cast: Groucho Marx, Chico Marx, Harpo Marx, Zeppo Marx, Margaret Dumont, Raquel Torres, Louis Calhern, Edgar Kennedy. Duck Soup is indisputably the Marx Brothers’ greatest film. It is the last of the five films the Brothers made for Paramount Pictures during their most creative and anarchic period. The first two films, Cocoanuts (1929) and Animal Crackers (1930) were adaptations of their hit stage comedies and suffer from a theatrical inertia, while the next three, Monkey Business (1931), Horse Feathers (1932), and Duck Soup, were based on original screenplays. Duck Soup was the only one of these films that fully integrated and balanced all of the Marx Brothers’ comic elements. Perhaps because of its uncompromisingly absurd nature the film was a resounding commercial failure and with its failure the Marx Brothers had their contract with Paramount terminated. They relocated to MGM where they were constrained by superfluous love stories with juvenile leads and an increased number of extraneous musical interludes. Ironically, these films for MGM were their most successful films commercially but perhaps marked the beginning of the end of their feature film careers. For the five Paramount films there were four brothers, a fifth, Gummo, left the line-up before they moved into the cinema. These brothers were so different to each other they seemed unrelated. Groucho was the leader, the slick greaser whose chief weapon was his mastery of the English language, yet he was as phoney as his moustache. Chico, with his fake Italian accent, represented the poor European immigrant who had arrived in America in search of a better future. Chico’s strength, or weakness if you like, was his catalogue of bad puns. During his trial as a spy in Duck Soup he is asked, “Isn’t it true you tried to sell Freedonia’s secret coded plans?” He replies, unembarrassed, “Sure I sold a code and 2 pair of plans.” Curly, blonde-haired Harpo was mute, yet his lack of speech was never a hindrance, frequently being placed in a position were speech was mandatory and always coping. For example, in Monkey Business he attempts to get through the American customs by carrying a gramophone and pretending to be Maurice Chevalier. At one point in Duck Soup he answers the phone for Groucho. I wonder if his character really was mute! Finally there was the much-maligned Zeppo. The ersatz WASP of the team, almost the comic straight-man and yet he was always in on the joke. He is generally regarded as the least talented of the four and yet he was in their best movies. Is this purely a coincidence or did he contribute significantly to their artistic success? Zeppo left the team to become a theatrical agent just after their Paramount contract was terminated. The Marx Brothers are justifiably seen as the cinematic auteurs of their films partly because, apart from Duck Soup, the direction of their films is competent at best and frequently rudimentary. Nevertheless, Duck Soup is the product of a fortunate collaboration with the masterful comedy director Leo McCarey who understood his performers’ comic genius. Duck Soup is definitely one of McCarey’s better films even if it is not his best. McCarey began his filmmaking career in 1918 at Universal Studios, first as third assistant director to Tod Browning and then as a script supervisor. He then moved to the Hal Roach Studios where he directed and ‘supervised’ over 300 shorts, some of them brilliant, for Charley Chase and Laurel and Hardy, amongst others. He then signed with the Fox Studios before settling at the Paramount Studios where he made The Kid from Spain (1932) with Eddie Cantor, and Duck Soup. The failure of Duck Soup didn’t slow his career and he directed in quick succession Charlie Ruggles’ and W. C. Fields’ Six of a Kind (1934) and Mae West’s Belle of the Nineties (1934). This period (1923 -1936), during which McCarey worked with many of the comedy greats, is generally regarded as his apprenticeship. McCarey’s mature works followed, including Make Way for Tomorrow (1937), The Awful Truth (1937) and Love Affair (1939) (the original and better version of McCarey’s later An Affair to Remember ). The final period, through the fifties and into the sixties is regarded as the period where, with the notable exception of the much loved An Affair to Remember, McCarey’s directorial skills failed him. During this time McCarey produced several lamentable anticommunist tracts, these often obscuring a critical assessment of his earlier works. Duck Soup opens like many of the musical comedies made in the very early 30s. It is not unlike Lubitsch’s quaint and hugely successful The Smiling Lieutenant (1931). 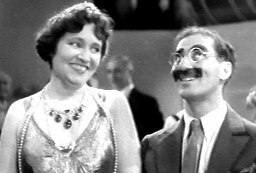 In Duck Soup, Mrs Teasdale (Margaret Dumont) will only fund the ailing economy if Rufus T. Firefly (Groucho), “a progressive, fearless fighter”, is installed as the leader of Freedonia. The duplicitous ambassador of Sylvania has other plans. He intends to marry Mrs. Teasdale and rule Freedonia himself. At a reception to welcome Firefly, the guard of honour enters followed by a troupe of ballerinas who scatter flowers in preparation for the arrival of the new leader. The camera swoops upward, the satire intrinsic to musical comedy is forced to its extreme. Six minutes into this 68-minute film the illusion of pomp and grandeur is sabotaged when Firefly (Groucho) appears, not via the expected grand entrance but down a fireman’s pole, behind the action. The humour begins and from then, until the end, the film virtually operates as two discreet entities. The Marx Brothers appear in a separate film to the straight characters, that is, the performers who are not comedians and who never get the joke. Nevertheless, Edgar Kennedy, the veteran silent film comedian featured in many Charlie Chaplin and Laurel and Hardy shorts, appears in three sequences and is definitely ‘in’ on the joke. His reaction to the Marx Brothers’ behaviour is in stark contrast to that displayed by the other characters within the film. Kennedy is the only character who is allowed to inflict physical discomfort upon any of the brothers. In the first of his three scenes, the synchronicity between Kennedy, Chico and Harpo as they exchange hats and leg shakes is remarkable. Kennedy’s frustration grows as he suffers increasing indignities at the hands of the two brothers, eventually he responds by squirting water down Harpo’s pants. Harpo reacts with disbelief and then slinks away, beaten, for the moment anyway. Duck Soup‘s trite B-grade drama operates in parallel and contrast to the Marx Brothers’ absurdist comedy. This is beautifully illustrated in Margaret Dumont’s first scene with Groucho. Dumont is serious, with a pompous dignity, her reactions to Groucho’s misplaced humour are various, including outrage and moral indignation, yet she never acknowledges Groucho’s ‘wink’. She describes Firefly as “a progressive, fearless fighter” but Groucho never displays any responsibility and to the contrary undermines the notion in his opening song. “If you think this country’s bad off now, just wait until I get through with it,” he sings. Dumont perfectly demonstrates why she is one of the great ‘straight men’ of all time. Her performance alone is a joy to watch. And this demonstrates one of McCarey’s strengths as a director. He builds his film around actors, yet there is also an intuitive understanding of the technical power of filmmaking. McCarey allows his comedians to milk their humour without remaining subservient to narrative logic or character consistency. Chicolino (Chico) and Pinky (Harpo) are two spies who, along with Firefly, display no real allegiance to either of the opposing factions. This helps to maintain the comic pace of the film and says much about nationalistic jingoism and patriotic hysteria. The film is crammed with verbal humour, but visual jokes also abound. The way in which the combination coexists is clearly seen in Pinky and Chicolino’s initial briefing with the Sylvanian ambassador. Visual gags regularly interrupt the string of verbal humour. The image is held longer during the verbal routine, emphasising the performance, while rapid editing propels the visual gags. The joke is the supreme goal. In their other films, each of the Marx Brothers have individual musical numbers. Although these can frequently be beguiling, they have a tendency to slow the pace of the films. Here there is a brief joke where Harpo plucks on the strings of a grand piano and the sounds of a harp are produced but otherwise no explicit solo routines exist. This film, unlike the Marx Brothers’ other films, never has a dull moment. It is a lean and mean (and callous) piece of filmmaking, with all superfluous material excluded. I remember reading an article critical of the unrelenting nature of the humour in this film that didn’t allow one to fully appreciate each individual gag. If only more comedies were guilty of this crime. Biographical details are taken from: Christopher Lyon (ed.) The International Dictionary of Films and Filmmakers: Directors (London: Papermac, 1987) 357, and Christopher Lyon (ed.) Actors and Actresses (London: Papermac, 1999) 413.